Explore the dark alleys of Harbor Prime and a host of diverse locations in both physical reality and the wild reaches of cyberspace. Discover the truth behind an enigmatic AI striving to reach the Singularity, a theoretical “event horizon” in which artificial intelligence will surpass human intelligence and all bets about the future will be off. How will you play your part in the story? Update #17: Game Extension & Unique Armor Types Goal Achieved! Update #16: Last 20 Hours! Add-Ons Opened! Update #15: Wii U Achieved, Game Extension in Detail, & New Trailer! Update #12: Greenlit, First Stretch Goal Hit, GOG & Other News! Update #11: Final Week + New Screenshot Bundle! Update #10: 1000 Backers + Stasis! Update #8: More Music & New Reward Tiers! Update #5: Funded! Stretch Goals Revealed! Multiplatform development: Game is being developed in the Unity 3D game engine for PC (Windows), Mac, Linux, and OUYA. DRM-Free: Dex will be distributed DRM-Free, with an option to receive a Steam key (if we succeed on Greenlight). All of the team members involved in Dex have made a very personal contribution to the game. Locations are hand-drawn; all levels are integrated parts of the world and yet each of them tells its own story – about the local low-life, the corporations, the Illuminati, the events in cyberspace, the main protagonist, and the emancipated artificial intelligence seeking the Singularity. Side missions (“runs”) are a major adjunct to the main storyline, allowing the player to meet intriguing characters, explore the city, and experience the whole story from other perspectives. Our approach is to create a lower number of substantive side missions rather than a higher number of generic, go-fetch-come back quests. We prefer that every side mission add a real value to gameplay, the story, or the game world – whether by introducing an interesting NPC, a spectacular location with unique obstacles, an interesting boss fight, or other distinctive game element. The levels and gameplay are non-linear and feature alternative solutions to each problem and obstacle. In other words, the game injects the poison (a problem, an enemy, an obstacle) and offers various antidotes (skills, abilities, equipment). The rest is up to you. In our vision, this is what makes an RPG a true Role Playing Game – the freedom to choose how to do things. Dynamics and pacing are reminiscent of Castlevania or Metroid titles with a smattering of the Deus Ex and Splinter Cell series. Other notable references and inspirations include Blackthorne, Flashback, and IJI. Is the era of true cyberpunk lost in the wormholes of time? We believe there is an exciting way to present cyberpunk (and cyberspace!) to modern audiences, updated to include the latest technological trends. With Dex, we have two intertwining realities. An obstacle or problem in physical reality can be overcome through cyberspace. On the other hand, if too many ICE (Intrusion Countermeasure Electronics) are encountered in cyberspace, it might be better to return to the physical body and overcome the area’s obstacles by an alternative route. All locations and important gameplay objects (enemies, cameras, turrets, drones…) have a corresponding representation in augmented reality. This twofold division allows for multiple solutions to game problems in a natural and authentic way. NOTE: You can read more about augmented reality and cyberspace in Dex in our first update! Take a moment to listen to Dex soundtrack samples, created by our talented composer Karel Antonin (www.karelantonin.com). Your pledge of £7 ($11.20) or greater will get you a free copy of the final game when it’s released. Based on a survey among backers, this may be a Steam key (providing we make it through Steam Greenlight), Desura key, OUYA key, or DRM-free download for PC/Mac/Linux. Pledging £15 ($23.90) or more grants access to closed Alpha and Beta releases, along with entry to internal development forums (and your name in the Credits as a Tester!). The Alpha build (features and content complete, but unfinished and untested) is scheduled for February 2014, while the Beta build (mostly finished game, but without final proofreading, voice acting, and play balancing) is scheduled for April/May 2014. Physical editions come in two versions: the basic Physical Edition (game DVD only) for a pledge of £30, and the Deluxe Physical Edition for all pledge tiers of £50 and above. The Deluxe Physical Edition features the game DVD plus a CD with the game soundtrack, a printed version of the Art Book, and a printed map (poster) of Harbor Prime. International shipping included. Your identity will be implanted in the game and immortalized forever in cyberspace. All Digital Identity Rewards offer a customized personal representation of you within the game itself: a tag (graffiti) on one of the walls or buildings in the city (with a style and text of your choice), an animated NPC with your face (or based upon sketch and/or guidelines provided by you) and a boss of your design (with your face or based on visuals you provide or suggest to us). The boss design includes a meeting with our designer and artist (via Skype or other online communicator), since we must design the whole encounter (where we meet the boss, what weapons and combat moves it uses, etc.). Ultimately, you can receive your own personal statue in an upscale part of the city, based on your image and featuring an inscription of your choosing (in-game this will be regarded as a statue of one of the founders of Harbor Prime). If you pledge for any of the tiers that include Digital Identity Rewards, we will contact you after the end of our Kickstarter campaign to discuss the details with you. All rewards of £1250 and above are unique – the first backer to pledge for them is the only one to receive them. Benefactor – This one is for art collectors. You’ll get the original artworks, drafts, and concepts used to create the Art Book, handmade and signed by our artists! Day with Developers – Come to our office for a day. This may include seeing not-yet-published game materials, watching us at work drawing levels and animating scenes, and joining us for the meals, along with an additional activity of your choice (bowling, dinner, sightseeing in Prague, nightlife, etc.). Produced By – Your name will appear in the game before anyone else’s with a Producer credit. No more, no less. Your contribution at this level really supports us a lot and for that you will get our eternal gratitude as well as visibility with everyone who plays the game. As for the community (you, our backers! ), we want to hear your feedback – what do you think about the game and its presentation, the mechanics, and the overall feeling? Backers at the Decker level and above – those who have access to early game builds and development forums – can influence the development by giving us feedback, opinions, and ideas or helping us decide amongst several alternatives. As for the use of funds, see below. The full game with all the features we want to include in it will cost more than the sum we aim to raise through Kickstarter. We have already invested a considerable amount of our own money. However, to realize our full vision, we are coming to you. Full English voice acting by professional actors, handpicked to fit in their roles and enliven the characters and story. Professional proofreading and editing by Andy Wolfendon, a writer and editor with extensive experience in the games industry (lead designer of Darkened Skye and a writer for Blizzard Entertainment). Since we are not native speakers, Andy helps us not only with grammar proofreading, but also with individualizing the game characters via unique vocabulary, street slang, accents, etc. He also brings senior-level advice to the team based on his 20+ years experience as a writer and game developer. Original music score by Karel Antonin mixing movie-style themes for important story parts with electronic background music fitting the atmosphere and pacing of the game. You can listen to some of his samples for games and movies on his website. Sound engineering by Andrej Sinkevic, our dedicated sound guy. Because Dex features stealth mechanics, mindful sound design is a major key to gameplay, so this is going to be a large job requiring months of intensive work. Hiring additional staff, most importantly 2-3 on-site game testers for the final development period to make sure the released game is well balanced, bug-free, and works well on all devices and operational systems we support (including various Linux distributions). All additional work done by freelancers, such as: polishing the GUI design, website, animated cutscenes, and other minor tasks. A live vocalist will join our composer Karel Antonin to add even more juice to the soundtrack! Plus a small chamber orchestra (3-5 professional musicians) will be hired to accompany the vocals and the synthesized tracks! Also, the game soundtrack (the reward for backers who qualify for the Deluxe Digital or Physical Edition) will be extended from 60 minutes to 75 minutes! Dex will be made available on Wii U about 2-3 months from the initial PC/MAC/Linux/OUYA release. The funds will cover the license fees and the additional development time for porting (programming, GUI, testing). Upon reaching this goal, all backers eligible for game download (£7 and above) will have the option of choosing the Wii U version. Note: This stretch goal will either prolong development time by a few months or will be available as post-release DLC (free for all backers eligible for Digital Game Download). We will add four unique armor types, including specific new gameplay parameters – not only different stats, but also organic features. Remember the Spike-Breaker from Castlevania or Hazmat suit from the Deus Ex? Like that. We will also expand the whole game by adding new areas and side-quests, creating new content, locations, and game moments to make the fullest use of our extension funds. Upon reaching this goal, Dex will be made available on NVidia Shield about 2-3 months from the initial PC/MAC/Linux/OUYA release. All backers eligible for game download (£7 and above) will have the option of choosing the NVidia Shield version. Localization of in-game texts (mainly GUI and dialogues), done by professional translators and native-speaking proofreaders and editors, in German and French. A whole new mission to take place on an island outside the borders of Harbor Prime will be added and organically melded into the game. Will you hack your way through or turn the island into a hell on Earth with firearms and explosives? Includes a whole new map, sized several vertical by several horizontal screens, with unique sprites and art, multiple solutions and paths! Localization of in-game texts (mainly GUI and dialogues), done by professional translators and native-speaking proofreaders and editors, in Spanish and Italian, plus one additional language based upon a poll of our backers. One of our two “open-world/sandbox” game extensions, Fighting Club will be a place where you can, well, fight... as well as practice and join tournaments. The location will probably be connected to a side mission or two and may involve dirty practices and reveal aspects of the personal backgrounds of some of the characters in the storyline. Fighting Club will probably also be connected to some achievements (in-game as well as Steam achievements, if you are on Steam) and – perhaps – some RPG features as well. Similar in concept to Fighting Club. A location where you can practice, shoot at targets, or perform various challenges. At the moment, we are considering an outdoor shooting range, beyond the city borders and an indoor one with sophisticated training drones. As with Fighting Club, we will connect the Shooting Range organically to the rest of the game, through characters and side missions. A documentary (30+ minutes) about the development of Dex, including developer commentaries, notes, and behind-the-scenes stories and footage. Filmed by a professional camera crew over the course of development (starting with the end of Kickstarter campaign and ending with the release of the game), this short movie will be a “time-lapse exposure” of real people creating a game under indie conditions. The movie will be available for download to all Kickstarter backers eligible for the Deluxe Digital Edition and above. At the moment, there are two major gangs in the city, which you are somehow involved with. 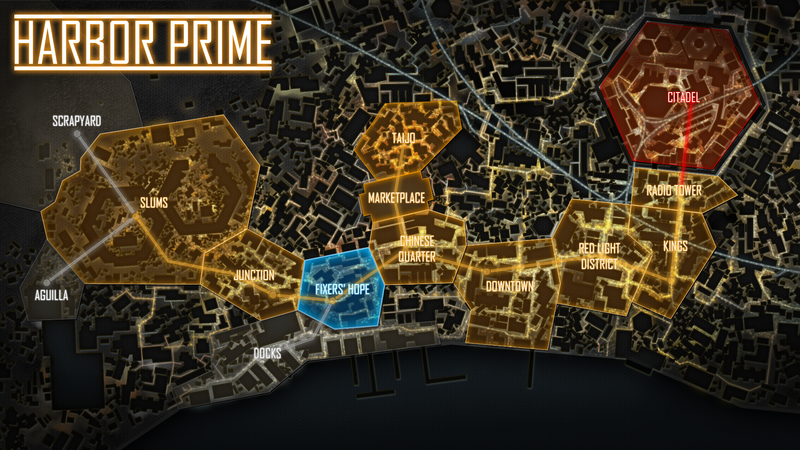 When we reach the £55000 Stretch Goal, we will add a third gang to rule the streets and underground of Harbor Prime. This addition will include new locations, a new gang headquarters, a whole third gang, and an array of gang missions for you to undertake. We will also flesh out the gang hierarchy more: you can perform missions for the gang of your choice, become its member, and climb the gang leadership ladder, with specific gameplay and story impacts. PS4 and Xbox One versions of Dex will be issued about 2-4 months from the initial release of the game. The funds will help us cover all license and legal fees and related development costs (programming, GUI, testing). All backers eligible for game download (£7 and above) will have the option of choosing the PS4/Xbox One version. You can learn about our team members in one of our updates. Linux: Ubuntu 10.04 or later and compatible distributions – Arch Linux, Gentoo, Debian, and possibly others. Mac: OS X "Snow Leopard" 10.6 or later. Regarding hardware requirements (for PCs): Graphics card with shader model 2.0 capabilities (DirectX or OpenGL, any ATi or NVidia card made since 2004 should work, or Intel cards with Occlusion Query support), 1 GB RAM, 8 GB disc space. Additional platforms and devices are possible, but will not be available immediately upon initial launch. We're participating in OUYA's #FreeTheGames Fund, created by OUYA to support developers making new and creative console games. OUYA will match your pledge dollar-for-dollar up to your goal amount (and a max of $250,000), so help us get there and make a great game for everyone! To be eligible for this match, we commit that this game will be an OUYA exclusive for a period of time. To learn more about OUYA, go to www.OUYA.tv. Note: the exclusivity applies only among consoles and does not affect Windows/Linux/Mac release! The game, upon release, will be simultaneously available for PC (Win, Linux), Mac, and OUYA. Backers eligible for game download will receive the game for the platform of their choice or will get a key to redeem it on Desura/Steam (again, provided we make it through Greenlight) or GOG (if possible). We are determined to complete the game. Without funds from Kickstarter, though, it will take a much longer development time and we will have to omit some features and content, especially material produced by external freelancers. Dex is already quite far along in development and is following a clear vision of what the game will be like when finished. The close of pre-alpha development (i.e. adding, subtracting, and experimenting with features and content) is scheduled for February 2014. This means we are nearing the feature-stop phase, but are maintaining flexibility for multiple possible Kickstarter outcomes (finance-wise) as well as for adjustments and ideas based on your input. Because game development is hard to predict, there may be delays in the original plan. Budget-wise, we plan to set aside a reserve fund to cover potential delays. Should our estimated workflow proceed as expected, the reserve will be used for free post-release updates, fixes, enhancements etc. ; otherwise we are prepared for a possible longer development time. We will keep everyone updated to make sure you know what we are doing at every moment and which phase we are in. THANK YOU! You will receive a heartfelt thank-you email plus access to backers-only updates! DIGITAL EDITION: a downloadable copy of Dex, upon release, is yours to play and enjoy! DELUXE DIGITAL EDITION: a digital download of Dex, extended edition of the game soundtrack by our composer Karel Antonin, PDF compiled Art Book/Manual/Design Notes, plus a detailed digital map of Harbor Prime. DELUXE DIGITAL EDITION + EARLY ACCESS: all of the above benefits (Deluxe Digital Edition), plus Early Access - get your hands on the game while it’s still in development and let your suggestions and feedback be heard! Includes an invitation to internal development forums, and your name in the credits as a supporter and beta-tester. PHYSICAL EDITION: Physical edition of Dex on DVD, plus all of the above benefits. International shipping included. DELUXE PHYSICAL EDITION: Game DVD, CD Soundtrack Extended Edition, Printed Art Book/Manual/Design Notes and a printed map (poster) of Harbor Prime with additional game clues and markers on important locations and gang territories. Plus all benefits in the £15 tier (Deluxe Digital Edition, Early Access, development forums, and name in credits). International shipping included. DELUXE PHYSICAL EDITION: Exactly the same as the £50 reward tier. First and last limit extension. International shipping included! STREET ARTIST: A tag/graffiti of your custom design on a wall in Harbor Prime (in the game itself). Includes all benefits in the £50 tier. CITIZEN: An in-game NPC based on your picture/photo/instructions will be created by our artists and will tread the streets of Harbor Prime (or perform some nefarious activity such as juggling). Includes all benefits in the £50 tier. MUSIC LOVER: Our music composer Karel Antonin will compose a music track specifically for you, based on the topic you choose and your suggestions about style and approach (within reason, as to both the style and length; around 2-3 minutes for a track is fine). You may use the track as you wish – a gift for someone or a song for your new game. Includes all benefits in the £50 tier. BOSS: A boss in one of the game’s side missions or dark alleys will be created based on your instructions. This includes a design meeting (Skype/online) with our designer and artist to specify the visuals, attacks, advantages/disadvantages, and the whole setting of the encounter. Includes all benefits in the £50 tier. FOUNDING FATHER: You’ll be immortalized as one of the founders of Harbor Prime via a statue in one of the luxurious parts of the city. The statue will be based on a photo/instructions provided by you. Includes all benefits in the £50 tier. ART LOVER: you’ll receive our heartfelt thanks along with a collection of artworks and concept sketches used for the production of our Art Book. Hand-signed originals drawn by our artists are yours only! Includes all benefits in the £50 tier. CORPORATE PRESENCE: Your company will be featured as one of the corporations in-game. The company may be based on a real company you run or may be purely fictional. In either case this tier will include an online meeting with our designer and artist to tailor the company presentation to the game world and create a set of billboards and commercials that not only fit the atmosphere of Harbor Prime but also present your company in the light you desire. Includes all benefits in the £50 tier. DAY WITH DEVELOPERS: You get a day with the developers at our offices in Prague. Observe our on on-site development work, see the process of drawing and animation, give us your feedback and opinions on the game, sit back, relax, have lunch and dinner with us and enjoy the evening in Prague. We will gladly discuss a program for the day and evening with you beforehand and help you organize sightseeing in Prague in case you want to stay longer. Includes two nights in a four-star hotel and delicious meals (or developer-style pizza boxes in the office). Travel costs to/from Prague not included. Includes all benefits in the £50 tier. PRODUCED BY: Your name will appear in the game intro before everyone else’s. After all, your pledge at this level greatly supports the development and you deserve an honorable place in the game: Produced by… you!